A solar charge controller is the most important component in virtually all solar power systems that utilize charging batteries. It’s the heart of the system which regulates the power going from the solar panels to the batteries. The best solar charge controllers can improve the efficiency of your system by as much as 30%, sometimes even up to 50% if you know how to install properly. Maximum Power Point Tracking (MPPT) is the best type of solar charge controller that helps you to get the most from the solar panels and significantly increase battery life. Because MPPT charge controllers are much more efficient than the traditional PWM solar charge controllers, they’ve been widely using in most solar off-grid systems and in RV solar systems. However, do you know how to choose the best MPPT charge controller for your solar power system? There are so many options out there and the fact is most of them are low-quality products. We’ve compiled a large amount of information that will hopefully help you find the best fit and know how to correctly size your charge controller. We also review some of the best MPPT charge controllers on the market that we think you should buy. What’s the best Pure Sine Wave Inverter for me? 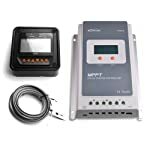 When it comes to choosing an MPPT solar charge controller for an off-grid solar system, there is no better choice than the Midnite Solar Classic MPPT Solar Charge Controllers. You can get your from other top brands such as Blue Sky, Genasun, Magnum Energy, Morningstar Corporation, Outback Power, or Schneider Electric (Xantrex), but we find the Midnite Solar’s controllers are the most efficient and the most stable as well. And, best of all, most Midnite MPPT charge controllers have Arc Fault Detection (Outback Flexmax offers it as an optional), which automatically trips a circuit when it detects dangerous electric arcs. This feature makes the controller very safe to use. All of the Midnite Classic MPPT charge controllers are made in America, that’s why you should expect that they have a very high quality. 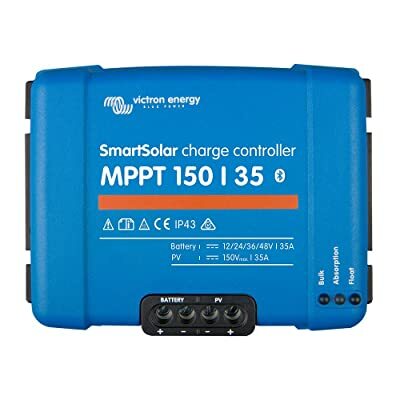 If you’re looking for the best MPPT charge controller for the solar PV system in your RV, the Victron SmartSolar MPPT Solar Charge Controllers are probably the most suitable choice. These charge controllers are programmed to charge battery voltages from 12 VDC to 48 VDC – most RV’s deep cycle batteries are in this range. The Victron SmartSolar controllers support a wide variety of system designs, battery chemistries, and integrate seamlessly in terms of system data management and programming. With built-in Bluetooth and free VictronConnect app, you can view and set battery voltage, solar history, load output, flexible battery charge algorithms plus day/night timing and light dimming options from your smartphones. What’s an MPPT Charge Controller? Maximum Power Point Tracking, frequently referred to as MPPT, is an electronic system that operates the Photovoltaic (PV) modules in a manner that allows the modules to produce all the power they are capable of. MPPT is not a mechanical tracking system that “physically moves” the modules to make them point more directly at the sun. MPPT is a fully electronic/digital system that varies the electrical operating point of the modules so that the modules are able to deliver maximum available power. In the other words, an MPPT charge controller looks at the output of the solar panels and compares it to the battery voltage. It then figures out what is the best power that the panel can put out to charge the battery. It takes this and converts it to best voltage to get maximum AMPS into the solar batteries. Most modern MPPT charge controllers are around 93-95% efficient in the conversion, however, some of the best MPPT charge controllers can even be up to 97-99%. You typically get a 20 to 45% power gain in winter and 10-15% in summer. Actual gain can vary widely depending weather, temperature, battery state of charge, and other factors. The “MPPT vs. Non-MPPT” graph below shows that the output of an MPPT charge controller operates at the “knee” of the I-V curve—at the maximum power point. As sunlight intensity, array voltage, and battery bank voltage change throughout the day, the MPPT charge controller automatically readjusts to put the maximum current into the batteries. Cold weather, cloudy or hazy days: solar panels work better at cold and cloudy conditions, but without an MPPT you are losing most of that. Cold weather is most likely in winter – the time when sun hours are low and you need the power to recharge batteries the most. Low battery charge – the lower the state of charge in your battery, the more current an MPPT puts into them – another time when the extra power is needed the most. You can have both of these conditions at the same time. Long wire runs – The best MPPT charge controllers allow you to use your solar panels with a higher voltage output than the operating voltage of the battery system, that allows much smaller gauge wire to be used. For example, if you are charging a 12-volt battery, and your solar panels are 100 feet away, the voltage drop and power loss can be considerable unless you use very large wire. That can be very expensive. But if you have four 12 volt panels wired in series for 48 volts, the power loss is much less, and the controller will convert that high voltage to 12 volts or 24 volts at the battery. That also means that if you have a high voltage panel setup feeding the controller, you can use much smaller wire. 12V, 24V, and 48V battery banks are at this time the most popular configurations in off-grid systems and in RV/marine solar systems. 12V small. 24V medium. 48V on larger installations. The best MPPT solar charge controllers can be easily programmed and changed from the default 12V setting to 24, 36, 48 and 60V to match your battery bank. MPPT vs. PWM – Why MPPT is Better? This is one of the most frequent questions asked when it comes to solar charge controllers. Why is MPPT better than PWM? The PWM (Pulse Width Modulation) charge controller is in essence a switch that connects a solar array to the battery. The result is that the voltage of the array will be pulled down to near that of the battery. This leads to a suboptimal power output wattage (Watt = Amp x Volt) at low and at very high solar cell temperatures. At very high cell temperatures the voltage drop off point may decrease below the voltage needed to fully charge the battery. As array area increases linearly with power, cabling cross-sectional area, and cable length therefore both increase with power, resulting in substantial cable costs, in the case of arrays exceeding a few 100 Watts. In times of rainy or heavily clouded days or during heavy intermittent loads a situation may occur where the battery voltage becomes lower than is normal. This would further pull down the panel voltage; thus degrading the output even further. In a nutshell, the PWM charge controller is a good low-cost solution for small solar power systems only, but shouldn’t be used in an off-grid solar system. If you’re interested in a PWM charge controller, the Morningstar TS-45 TriStar 45 Amp PWM Charge Controller is an excellent option to consider. Besides performing the function of a basic charge controller, an MPPT charge controller also includes a DC to DC voltage converter, converting the voltage of the array to that required by the battery bank, with very little loss of power. The best MPPT charge controller will adjust its input voltage to harvest the maximum power from the solar array and then transform this power to supply the varying voltage requirement of the battery plus load. Thus, it essentially decouples the array and battery voltages, so that there can be a 12-volt battery on one side of the MPPT charge controller and four 12V panels wired in series to produce 48 volts on the other. If connected to a solar panels array with a substantially higher nominal voltage than the battery voltage, an MPPT charge controller will therefore provide charge current even at very high cell temperatures or in low irradiance conditions when a PWM charge controller would not help much. As array size increases, cable length will increase. The option to wire more solar panels in series and thereby decrease current is a compelling reason to install an MPPT controller as soon as the array power exceeds a few hundred Watts (12V battery), or several 100 Watts (24V battery), several 1000 Watts (48V battery). Some of the best MPPT charge controllers, such as the Midnite Solar Classic 150 Charge Controller, are designed to work when the PV array is up to 150VDC. 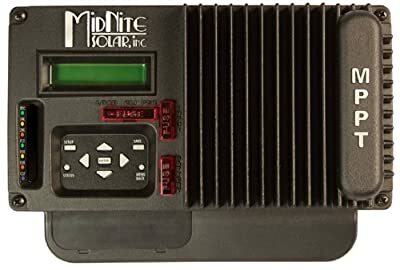 The Midnite Solar Classic 150 has a maximum output current of 96 amps, an operating voltage of 150 volts and works with 12 to 72 volts battery systems. Sizing solar charge controllers is pretty simple really. Solar charge controllers are rated by current and voltage. These ratings depend on your solar array’s current (amps) and the battery voltage. Therefore, solar charge controller sizing basically involves “getting a charge controller big enough to handle the amount of power and current produced by your solar energy system”. To get the right charge controller size, first, limit your choices to controllers that work with your battery bank voltage, which will usually be 12V, 24V, or 48V. Then, calculate the approximate maximum amperage your controller will need to handle. Divide the PV array watts by the system voltage to get amperage, then add a 25% safety margin to account for higher irradiance conditions. For example, a solar array is producing 720W with 48V and charging a battery bank of 24V. The controller size is then 720/24 = 30 amps. Introduce a safety factor by multiplying the value you have found by 1.25 to account for variable power outputs: 30 x 1.25 = 37.5 amps. So you need a 24V, 40A MPPT charge controller that supports a 48V input. However, sizing MPPT charge controllers isn’t that simple. All MPPT charge controllers have an upper voltage limit. This refers to the maximum amount of voltage they can handle from the solar array. Meaning that if you exceed this voltage, the charge controller can be permanently damaged. However, the fact is the solar PV arrays wiring in series produce higher voltages in cold weather, so an array of four 12V modules in series for 48V might be just fine during the summer for an MPPT charge controller with a 48 V maximum rating—but could damage the controller when it is cold. Therefore, the best MPPT charge controllers for you should have upper voltage limit that is higher than the voltage your PV array produces. Below we listed some of the best MPPT solar charge controllers on the market that we think are best for you. 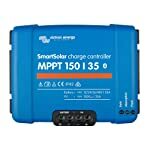 When it comes to choosing a solar charge controller for an off-grid system, the MidNite Solar Classic MPPT Charge Controllers are the best choice. The MidNite Classic charge controller is unique in its ability to be used for a great variety of DC input sources. It is designed to regulate DC input from PV, and Approved Hydro and Wind turbines. The Classic 150, 200 and 250 are designed to work with 12, 24, 36, 48, 60 and 72V battery banks. With the Classic 150 ranging up to 96 amps, the Classic 200, 79 amps and the Classic 250, 63 amps, why would you need any other controller? All of them come with built-in Arc Fault Detection, making them very safe to use. The Classic 150 MPPT Charge Controller is MidNite Solar’s most popular model. 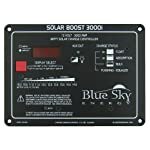 If you have a very large solar power system, you can buy 2 or 3 of Midnite Classic controllers and wire them in series to have a bigger controller. Another significant advance with the Midnite Solar Classic is the ability to access your power system remotely via the MidNite Solar Local Application. This app enables you to monitor your Classics over your local network or the Internet. So if you’re out of town, you can call into the system to troubleshoot problems, and get it back in working order. If you have plenty of excess power, you can even turn on the snow-melting feature while you’re away. Midnite not only offers one of the best MPPT charge controllers on the market, but also offers an industry first, an extended warranty for all the Classic MPPT charge controllers. 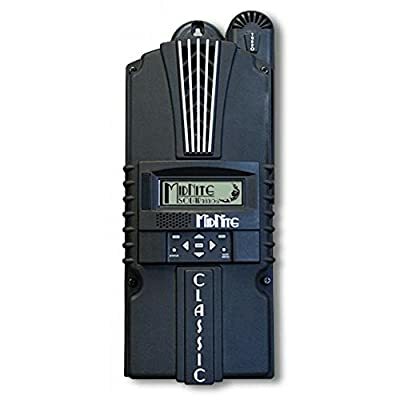 Six months prior to the end of the warranty period, you can ship their Classic back to MidNite Solar with a check for $147 dollars plus shipping and they will replace any wearable parts and do a general tune-up. This will extend the warranty by 2 additional years. That’s awesome! Plus, the design and manufacturing of MidNite Solar’s products are done at company headquarters in Arlington, Washington, and all qualify as “Made in America“. Another good reason to purchase a Midnite Classic MPPT charge controller. 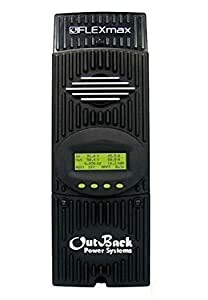 Along with the Classic lines of Midnite MPPT charge controllers, the Outback Flexmax FM80 stands out among their competition as one of the very best MPPT charge controllers available. This charge controller can handle up to 150 Volts DC from the solar array, which is stepped down to the battery bank voltage from 12VDC to 60VDC. It supports a wide variety of system designs, battery chemistries, and integrate seamlessly in terms of system data management and programming. The Flexmax FM80 comes with a built-in 80 character display that shows you the current system status and data logs from the last 128 days. For more advanced functions and configuration, you can connect an optional MATE system display and controller. If you are using an Outback brand inverter, you can connect the FM80 and the inverter to a single MATE3 controller using a HUB communications manager. Only the MATE3 controller is compatible with new Outback inverters. If you’re looking for a solar charge controller for the solar power system in your RV, the Victron SmartSolar MPPT is a perfect choice. With a wide range of options, you can easily find the right size of the controller that is suitable for your system. Using the latest, fastest technology, SmartSolar maximizes this energy-harvest, driving it intelligently to achieve a full charge in the shortest possible time. In Victron’s MPPT model names, for example, MPPT 100/50, the first number is the maximum PV open circuit voltage. The second number, 50, is the maximum charge current. One of the key features that makes Victron SmartSolar controllers one of the best MPPT charge controllers on the market is the ability to control your system from away. They offer built-in Bluetooth connectivity which enables setup, monitoring, and updates with a Smartphone or other Bluetooth-enabled device. If your installation is connected to the internet Victron Remote Management Portal (VRM) provides access to the full power of your MPPT, anytime, anywhere; both services are free to use. 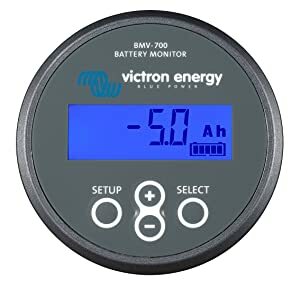 All Victron’s MPPT charge controllers work perfectly with the Victron battery monitor BMV-700 series, which monitors multiple parameters for the battery bank. It lets you view live status information, including solar watts, battery voltage, charge current, load current and more. And it can be easily mounted on a wall in your RV. Victron Energy based in the Netherlands has been manufacturing power conversion equipment since 1975 and have become well known for producing quality and reliable battery inverters and chargers. The automotive & boating market where micropower systems are common is where Victron really stands out from the crowd being one of the few high-quality manufacturers in the field. Morningstar Corporation makes some of the best MPPT charge controllers on the market. 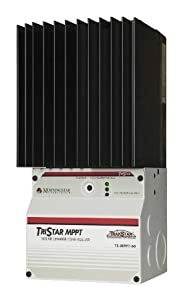 The Morningstar’s TriStar MPPT TS-60 solar controller features TrakStar Technology, an advanced maximum power point tracking battery charger for off-grid PV systems up to 3kW. The controller provides the industry’s highest peak efficiency of 99% and loses significantly less power compared to other MPPT controllers. This particular model includes a Remote Temp Sensor. The TriStar MPPT features “smart tracking” that maximizes the energy harvest from the PV by rapidly finding the solar array peak power point with extremely fast sweeping of the entire I-V curve. Unlike the MPPT TS-45, the MPPT TS-60 has an ethernet port for a fully web-enabled interface. Both products allow you to log up to 200 days of data. This charge controller will require DC disconnects and typically a combiner box with fuses or breakers for wiring the PV input. If you’re looking for an MPPT charge controller to charge your deep cycle marine batteries with solar panels, we’d suggest you buy the MidNite Solar Kid 30A MPPT Solar Charge Controller. This is one of the most versatile medium-sized charge controllers on the market that is designed specifically for the marine environment. You can also use it for a small off-grid solar system. The unit supports up to 150VDC input and is capable of charging battery banks at 12VDC, 24VDC, 36VDC, and 48VDC. As your power needs grow, and you need more than 30A, add more modules to the array, and a second KID. This will give you twice the power from a single array, and will act as a 60A charge controller for the system. Up to 12 charge controllers can be wired together, for even more potential, giving you a nice, scalable solution. The MidNite Solar Kid is not only one of the best MPPT charge controllers for you, it’s also designed as a lighting controller. It can turn lighting on at dusk for a select number of hours, turn it off for a length of time and then back on for a programmable number of hours before dawn. All time functions are fully adjustable, allowing users to save valuable energy. An additional feature in the lighting controller allows you to adjust the voltage needed on the PV module for the Kid to register “daytime”. This is important if you are using the Kid for a solar street light and the lights are located above the PV modules. Most controllers would end up leaving the light off all night, but not the KID! As a leader in the solar industry, Schneider Electric provides best-in-class charge controllers to the market. Schneider Electric’s Conext MPPT 60-150 is one of the best MPPT charge controllers for off-grid systems that can be used with solar arrays with voltages up to 150VDC supporting a charging output of up to 60A for battery banks configured from 12VDC to 60VDC. It features a large aluminum heat dissipator that eliminated the need for external fans. It comes with ground fault protection (GFDI) for negative grounded solar arrays. A battery temperature sensor is included with the charge controller. The Conext MPPT charge controller communicates seamlessly with other Conext equipment like the Schneider inverter from the series SW and XW+. It is possible to monitor and configure the charge controller remotely using the right accessories. It features a 2-line 16-character LCD screen with 4 faceplate buttons for easy configuration and real-time system monitoring. This MPPT charge controller is more common in commercial off-grid systems than in residential off-grid systems. 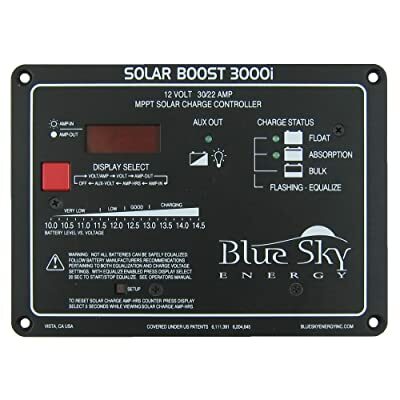 The Blue Sky SB3000i Solar Boost MPPT Solar Charge Controller is a great choice for small solar PV systems. It charges 12V batteries at up to 30 amps from conventional 36 cell 12V PV modules. It uses a three-stage charging algorithm of bulk, absorption, float and a manual or automatic equalization mode. A charge status LED indicates the present charge mode, and shows when the battery has become fully charged. The Blue Sky SB3000i is one of the best MPPT charge controllers for RVs and marine applications. It comes with a second battery output and IPN connection for remote display and networking. This controller can be programmed from its onboard display or in conjunction with a Blue Sky IPN Pro Remote. The display shows battery voltage, solar panel voltage, and input/output current. You can actually see current boost working by noting the difference between solar panel current and output charge current.